Philosopher George Santayana wrote, “Those who cannot remember the past are condemned to repeat it.” People in families affected by addictive disorders and the attendant stress find themselves in a downward spiral of makeshift coping with impossible situations. A common arena: family holiday get-togethers. 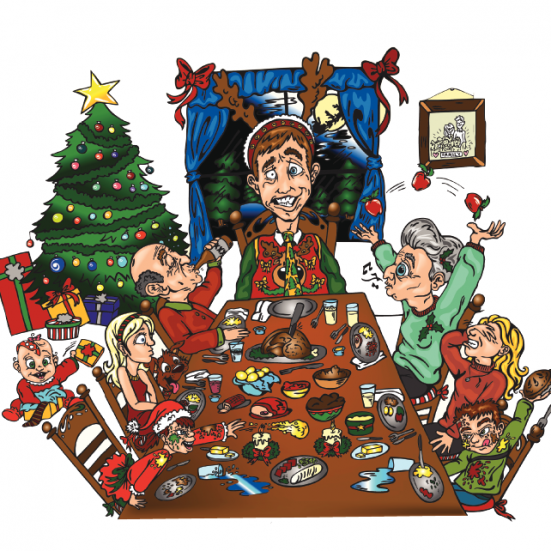 Living in these families is like being raised in a fun house with distorting mirrors. Like a script, these behavior patterns adopted by various family members become their modus operandi for life in general, both at the time and, unless they’re revised, for life. The “Good Child” (a.k.a. “Hero”), who becomes a high achiever or overachiever outside the family to escape the dysfunctional family environment, defining him/herself independently of his/her role in the dysfunctional family, currying favor with parents, and/or shielding him/herself from criticism by family members. The “Caretaker,” who takes responsibility for the emotional wellbeing of the family, often assuming a parental role (even if unwillingly). The “Lost Child,” the loner, the inconspicuous, quiet one, whose needs are usually ignored or hidden. The “Mascot” or “Family Clown,” the comedian, who diverts attention away from the increasingly dysfunctional family system. The “Mastermind,” the opportunist who capitalizes on the other family members’ faults to get whatever he or she wants; often the object of appeasement by grown-ups. The “Problem Child” (a.k.a. “Scapegoat”), who causes most problems related to the family’s dysfunction and/or who “acts out” in response to pre-existing family dysfunction, in the latter case often in an attempt to divert attention paid to another member who exhibits a pattern of similar misbehavior. All of this begs the question, why would anyone choose such constricting patterns of relating to others and to the wider world? The simple, stark answer: survival and repetitive training. Andrea, the “Caretaker” and “Hero,” is interrupting the scolding from Shirley in an effort to protect her parents so their feelings won’t be hurt. She secretly wishes her parents would just divorce and get it over with. Jack, the “Lost Child,” is staring down at the table silently, doing his best to disappear and insulate himself from the anger surrounding him and within him. When he can’t take any more of the turmoil, he excuses himself inconspicuously and leaves. Bobby, the “Mascot,” is incessantly cracking jokes, trying to “work the crowd” to keep everything from becoming an outright melee. No one here is in a laughing mood, so his efforts prove completely ineffective. Shirley, the “Mastermind,” is doing her dead-level best to intensify the argument by blaming her parents for the pain their arguing is causing. “Can’t you two ever behave yourselves?” she yells at them. David, the “Problem Child,” is in jail— again—for assaulting a drinking buddy at a local bar a week ago. That’s a pretty bleak scenario, but the good news is that CADA offers family involvement and professional support, and we also host a monthly family peersupport program funded from a grant from the Edna I. Davis Foundation. Family members can re-examine the “roles” they’ve perhaps felt they had to play in life. After all, any script can be rewritten. History doesn’t have to be repeated. Kent Dean has been active as a teacher and in addiction and mental health counseling since 1975. He is CADA’s director of clinical development, where he participates in staff development and in CADA clinical education outreach.